In Winnipeg, perogies are loaded with bacon, Cheddar and onions. 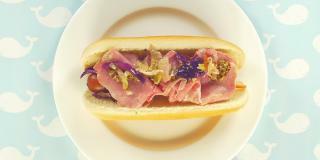 Top your hot dog the same way for a tasty treat. Beer-Braised Onions: In skillet, heat butter over medium heat; cook onions, sugar, salt and pepper for 5 minutes or until onions are tender. Stir in beer; cook, stirring occasionally, for 10 to 15 minutes or until onions are golden and no liquid remains in the pan. Meanwhile, grill hot dogs according to package directions. 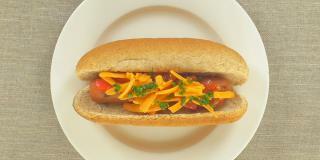 Assemble hot dogs in buns with Beer-Braised Onions, Cheddar and bacon. Garnish with sour cream and parsley (if using). Tip: For a lighter topping, replace sour cream with low-fat sour cream or low-fat Greek yogurt.